(Modern or contemporary) (Western or American) square dance is danced by (groups of) four couples arranged in a square formation in (square) position. Like the salsa rueda, there is a caller that calls the name of the next figure to perform by the dancers. The caller leads the dance, but usually does not participate him selves. Square Dance is a casual dance, without competitions or cups. 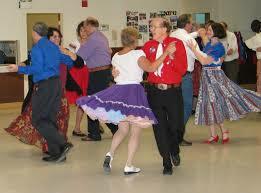 The roots of the square dance can be found in the melting pot of immigrants from Europe that went to America. Various elements (including the 'caller') came from court dances like the French quadrille and cotillion English, which are still recognizable. Also Scottish country dancing did their two cents. In the callsign Dosado, a figure which the partners crosses together backjwards, you recognize even the French dos-a-dos (back to back). Traditional square dance has 10 to 30 figures (calls). The music is usually performed live on acoustic instruments: violin, guitar and double bass, accordion and banjo. The "Modern American Square Dance" is taught the same way everywhere. All figures have the same English name. Each dancer so can dance anywhere in the world with the local groups. You start like all dances with the "Basic level", followed by "Mainstream" after 6 to 9 months. So do you know 68 figures who are called everywhere in all possible combinations. There are also added, higher levels: "Plus", "A1", "A2" (A = Advanced), "C1" and "C2" (C = Challenge). Thus you get about 100 figures. Most figures last for 4 to 32 counts. In the 20th century, after a period of declining interest, Henry Ford (1863-1947) (of the Ford cars, 1903) came in contact with Benjamin T. Lovett (1876-1952). He had a holiday camp where he learned Cowboy dancing. Ford was so enamored of this American dance that he bought the holiday camp, and asked Lovett from Greenfield Village in Michigan on to make Cowboy Dances popular again. All costs and publicity were paid by Ford. Lovett had also a radio program "The Early American Dance Music" from coast to coast that helped to create a craze of Cowboy Dances. In 1937 Ford built at the Edison Institute the Lovett Hall, where Lovett trained for 26 years dance teachers. New life was brought in that world by his demonstration group "The Cheyenne Mountain Dancers". Lovett's book with dancz and music was entitled "Good Morning". The edition of 1926 had the caption "After a Sleep of Twenty-Five Years, Old Fashioned Dancing is Beeing Revived by Mr. And Mrs. Henry Ford." Lloys "Pappy" Shaw devoured the book and realized that were were still lots of dances lost there. Many original dances were highly localized and different. Shaw inventory them in old miners and cowboys. So he got a whole list of dances and movements. In 1939 he published "Cowboy Dances." From 1950 callers discovered that they could varied control the dancers with different sequences of characters. In 1974 Callerlab, held the International Association of Square Dance Callers, organizes its first congress. From then on they standardized systematically calls and figures. Also important for the distribution of the square dance wase the use of records (no live band needed) and PA sound systems. So one caller by various groups in large rooms could be heard on squares. Music to which often is danced is country and western, but also rock and pop are commonplace. (Ex. Drinking Champagne, Gostriders in the sky, Moody Blue, Pink Cadillac, ...). A suitable rhythm for modern Western square dance is 120-128 bpm. In Belgium and the Netherlands there are Square Dance clubs and events. 19 states in America have the Square Dance appointed as their national dance. Round dance choreographies are series with ballroom-like figures at danced at fixed songs in a circle counterclockwise around the floor. Round dance has the same roots and the same history as all of Square Dance with which it during and after World War II from North -America came to Europe. Again there is a "cuer" who calls standardized movements, like the Salsa rueda or casino rueda. There are six phases or levels. The lowest closer to ethnic, folk, country and folk dance with rhythms of two-step and waltz. The higher difficulty levels contain tropes of all standard dances. Roundalab, the International Association of Round Dance Teachers, is responsible for promoting the dance forms and standardization.